Over the last few years, we were getting to know each other all over again and it was great. I'll always remember the fun times we had in high school and the weekends we shared with Judy, Sandy and Suzanne. I hope you are at peace. I will always remember the laughter and good times we shared. You will be missed by many. Joyce was he kind of friend you could not talk to for months and still feel close to. She was a great listener and really interested in her friends and their families - a person of simple sincerity. Once we entered the email era we communicated more often and it always seemed like high school and our club, the Decors, wasn't really that long ago. With great sadness I realize that I can no longer click on her name to share a joke or a thought. I write this with tears in my eyes. I will miss you, your kindness, getting e-mails and birthday cards from you. I feel very blessed having you in my life for 51 years. My fondest memory will be the time we spent over July 4th week end with Laurel reminiscing, laughing and talking. 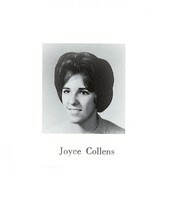 I only knew Joyce from the age of 10-13; elementary and maybe a minute in Junior High. She moved away from Dexter and I remained. I was the hoodlum, she was the sweetie. We were great friends. That little girl saw things in me that no-one else did. A few years later( a few years as we all know was an eternity back then) when I bussed from Dexter to Mumford we did not renew our friendship(probably my fault). I have not attended any prior reunions. Months ago I bumped into another Dexter girl whom I had not seen in ages and was told Joyce was coming to the reunion. As from time to time over the last 55 years joyce has popped in and out of my mind I decided I would attend only to see her, and tell her she made an impact on my life. I am deeply saddened for her family and realize the significant loss of such a wonderful lady.